In the end of May 2007, the first of initially three ordered Bormbardier Q400s arrived in Luxembourg, equipped with a fresh, new outfit. The virtually just as fast, but significantly cheaper turboprops replaced the Embraer Jets of Luxair�s fleet. The original of this Herpa mold novelty is the first �Q400�, registered LX-LGA, which is mainly operated on the route to Frankfurt. In 1954, the Australian TAA was the first airline outside of Europe to commission the then revolutionary Vickers Viscount. In 1996, the airline was merged with Qantas. 1:500 Southwest Airlines 737-300WL "Arizona One"
The 300 series has now become the veteran of the 737-only fleet. 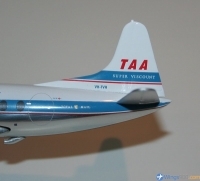 Nevertheless, the airline chose to retrofit them with the fuel-saving winglets, among them the popular �Arizona One�, sure to be remembered by many collectors. The original of this mold novelty was registered in the early 70s as an air force transporter in Aeroflot livery, registration CCCP-76780. Twenty years later it was still being operated by Aeroflot but with the registration RA-76780 and solely for civil purposes. As such it is released in the 1/500 scale. Only in 2006 did the at one time world�s biggest airline divest itself of all paramilitary airplanes. "2006s" Colors. With "Congratulations Wills & Kate" and "Hearts" sticker. Fourth Club Model of 2012, exclusive to Herpa Wings Club Members. New Generation V.
Slovenia's national airline, Adria Airways has a fleet of 13 aircraft, 4 of which are the CRJ-900ER and with another on the way. Air Berlin�s new subsidiary covers charter flights between Germany and Turkey. One of the relatively infrequent South American releases, this GOL model is certainly very nice. GOL Transportes Aereos is a Brazilian low cost airline with a fleet of 123 737NG's, and another 108 737-800's on order. This model, PR-GTF, is in a special livery commemorating GOL Transportes Aereos's 10 years of service. The flag carrier of Finland, Finnair has recently changed it's livery from a classy grey and cobalt blue to this new, bland, billboard of dark blue. This particular model is of Finnair's temporary Angry Birds livery. To rejuvenate its long-haul fleet, the first Airbus A330s were commissioned from 2010 to connect the popular holiday destination with Asia and continental USA.